Comprehensive review of Hampton Sun Sunless Tanning Gel. See what real experts and actual users have to say about this self tanning product. Overall, I ended up giving Hampton Sun Sunless Tanning Gel 3.25 out of 5 stars. I would’ve given it lower than that, but the color it produced was it’s redeeming quality. The things I didn’t like were 1) the price 2) the smell and 3) the drying time. You all know that gels take longer to dry, and this one was no exception. The smell of this one is one of the worst I’ve smelled. It smelled like straight DHA. The price is pretty high, so just be prepared for that! What I did like about Hampton Sun Sunless Tanning Gel is the color it produced. It gave me a very natural, medium shade tan. If you’re looking to be really dark than you probably won’t like it, but it gave me a very nice glow. 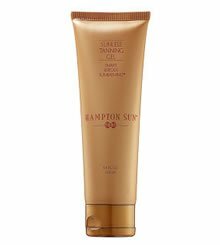 Hampton Sun Sunless Tanning Gel is a creamy, light tan gel. The texture is very nice and slick. The gel is not clear, it is opaque and relatively thick. This one goes on very nicely. It’s not messy at all, you don’t need to wear gloves. Since it’s a gel, it takes a few minutes to absorb into your skin. There’s no guide so the application process stays pretty clean. This gel took about 35 minutes to dry. It didn’t take as long as some gels, but it took longer than average. I’ve noticed that gels most always take longer to dry due to the consistency of the product. It smells like old self tanners used to smell….like pure DHA. I couldn’t stand the smell of this one, I was embarrassed to be around anyone after I applied it because it reeked. It left my bathroom smelling of self tanner too. The smell was gone when I woke up the next morning, I was so happy about that. Hampton Sun Sunless Tanning Gel produces an even medium tan. I like how my tan looked the next day, it was smooth and I had a sun kissed look. The color wasn’t super dark, I’d say it gave me a medium shade tan. The color wasn’t orange or fake looking either which was nice. This one faded after about 3-4 days. It got a little streaky as it faded, but it wasn’t too bad or embarrassing. You’ll probably need to apply this one twice a week to keep a medium glow. Ya, think this one is ok for men. It produces a nice medium shade which men will like. They’ll just have to get past the awful smell and long drying time. The price tag is also pretty steep, but it’s a decent product for men to use. The bottle is $36.00 on Sephora. That works out to $8.18 an ounce, which is on the pricier side. This one is definitely more expensive than a lot of self tanners out there. To buy Hampton Sun Sunless Tanning Gel, Click Here. Look and Feel This is a thick, tan gel. Application Application is simple and non messy. Drying Time It dried in about 35 minutes, a little longer than average. Smell (Before) Smells disgusting, like straight DHA in a bottle. Smell (After) The next morning the smell was gone, thankfully! Color Produced My tan was an even, medium tan. It looked very natural. How Long It Lasts It lasted about 3-4 days before it faded. OK For Men? Yeah, it’s an average product for men to try. Price $8.18 an ounce, that’s pretty expensive.